One of the many, many piles of clothes that no longer fit. As I mentioned yesterday, our annual garage sale was incredibly successful. We had a record year this year – better than any of the previous seven years. I certainly broke my own records. Why? Because I purged. Not only was I able to get rid of tons, (and tons,) of clothing, I also got rid of all sorts of household items. The clothing was easy. In the past ten months, since losing weight, I have gone from a size 16-18 to wearing a size 4 in slacks. Even though I’ve tried to hold onto a few things, size 2X clothes look pretty ridiculous on a size Medium frame. At some point, I decided it all had to go. Between donations to the thrift stores, gifts to friends and the sale, almost all of my old wardrobe is gone. 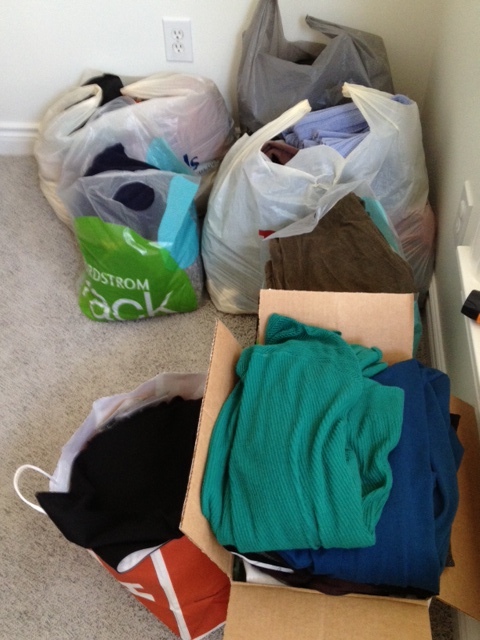 But it isn’t just clothes that I am getting rid of. I’ve been divorced for several years now, but I have finally hit the point where I’ve decided to purge everything. For a long time I kept things that my ex bought, but that I still liked. Not anymore. The truth was that even if I still liked the object, it still reminded me of him. Every time it looked at that chair or that rug, I had a tiny twinge of “yuck.” My divorce was fairly amicable, but that doesn’t mean I want to be reminded of it. So, in addition to clothes, I purged stuff. And even though I feel great about all the junk I cleared out, I realized that I am not done. It’s time to pare down my possessions to just the things I love. I need to clean up my house, just like have done with my health, and keep only what is important to me. I started this blog because I was trying to find the next step on my personal path. That step has been weight loss and getting fit. That is still going to be a big focus for me, but I’m ready to start thinning my possessions – along with my waistline.